2046a, USED HUBCAP CENTER, '81-'85, CADILLAC, ELDORADO, SEVILLE, CHROME OUTER RIM, CREAM BACKGROUND, CHROME LEAF, COLORED LOGO, 4-1/2" DIA. 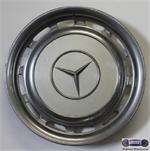 57001f, Hubcap used, 14", 65-85, MERCEDES, 200, 220, 230/4, 230/6, 250, 280, 300D, 300E, 380, 450, 500, 600, 12 SLOT TYPE, CHROME OUTER RING, PAINTED CREAM, RAISED CHROME LOGO, 4 METAL CLIPS. 67133b, CENTER CAP USED, 15", 72-89, PORSCHE, 911, 944, BLACK METAL, CREAM ENGRAVED CENTER, PUSH ON. 3-1/8" DIA.